Knowledge and the Early Modern City uses case studies from the sixteenth to the eighteenth centuries to examine the relationships between knowledge and the city and how these changed in a period when the nature and conception of both was drastically transformed. Both knowledge formation and the European city were increasingly caught up in broader institutional structures and regional and global networks of trade and exchange during the early modern period. Moreover, new ideas about the relationship between nature and the transcendent, as well as technological transformations, impacted upon both considerably. 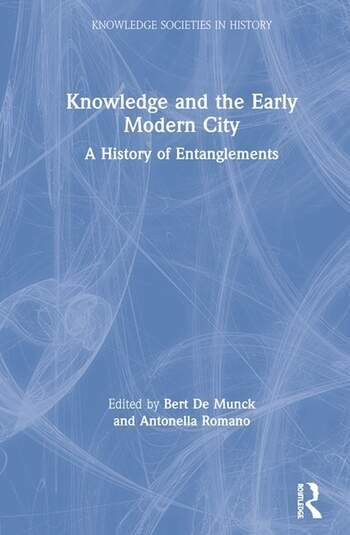 This book addresses the entanglement between knowledge production and the early modern urban environment while incorporating approaches to the city and knowledge in which both are seen as emerging from hybrid networks in which human and non-human elements continually interact and acquire meaning. It highlights how new forms of knowledge and new conceptions of the urban co-emerged in highly contingent practices, shedding a new light on present day ideas about the impact of cities on knowledge production and innovation. Providing the ideal starting point for those seeking to understand the role of urban institutions, actors and spaces in the production of knowledge and the development of the so-called ‘modern’ knowledge society, this is the perfect resource for students and scholars of early modern history and knowledge. Part 3. Imperial Cities, Knowledge for Empires? Bert De Munck is full Professor at the History Department at the University of Antwerp, Belgium. He is a member of the Centre for Urban History, Antwerp, and the Director of the interdisciplinary Urban Studies Institute and the international Scientific Research Community (WOG) ‘Urban Agency: The Historical Fabrication of the City as an Object of Study’. His publications include Guilds, Labour and the Urban Body Politic: Fabricating Community in the Southern Netherlands, 1300-1800 (2018). Antonella Romano is full Professor of History and Director of the Centre Alexandre Koyré at the Ecole des Hautes Études en Sciences Sociales, Paris. Her publications include the edited volume Rome et la science moderne entre Renaissance et Lumières (2008) and Impressions de Chine. L’Europe et l’englobement du monde (16e-17e siècles) (2016).